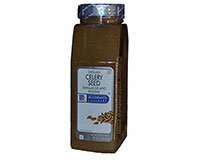 McCormick Ground Celery Seed has a flavor and aroma similar to the celery vegetable; the flavor notes are characteristically hay-like and grassy. While Celery Seed is the dried fruit of the herb Apium graveolens, which is related to to the vegetable celery plant, Celery Seed does not come from the same plant as the vegetable celery does. The tiny, brown Celery Seeds have a celery-like flavor and aroma. Celery has a special affinity with tomatoes and is primarily used in soups and salads, especially potato salad. Celery Seed can be used in egg dishes, sauces, soups, meats, dips, vegetables, and stuffings. Ground Celery Seed is especially suitable for use in recipes where you desire to have the herb blend into the recipe such as in soups, sauces, marinades, gravies and salad dressings.